We have a problem in Spanish class. In each of our most recent stories we created in class, we ended up with a cat that bullies other people and animals. It's an epidemic that we can't seem to get away from! :) Our most recent story featured Mildred, the bully cat who stole a mouse from an elderly woman in Atlantis. 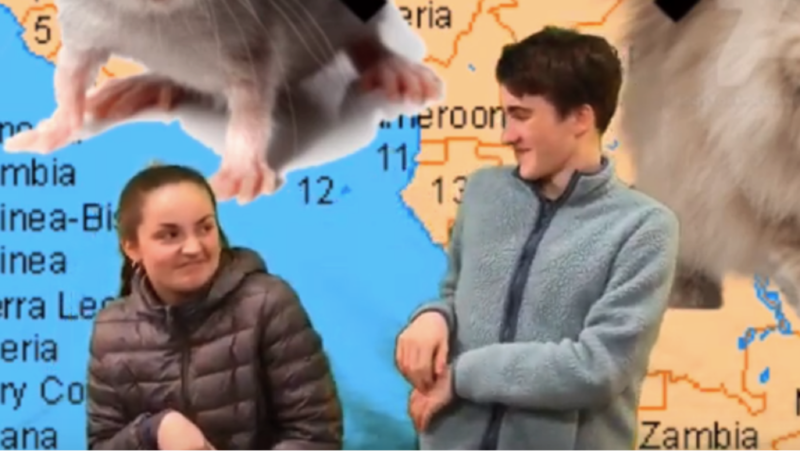 The above picture shows Ryan playing Mildred and Jada being the poor little mouse. Truly terrifying. Luckily, the students are having fun and acquiring new words with each story we make and record. We continue to focus on high-frequency words and using them in a variety of different situations. We start each day asking each other, "¿Cómo estás?" and sharing about our lives using Spanish words and phrases. It's a fun way to connect with each other and help cultivate a positive class environment, and to practice our speaking and listening skills as well. We have also been playing a lot of the board game "Guess Who", which is a fun and effective way to learn descriptive words such as hair color and eye color. The competition can get pretty fierce! We're looking forward to finishing the year strong! ¡Hasta la próxima!